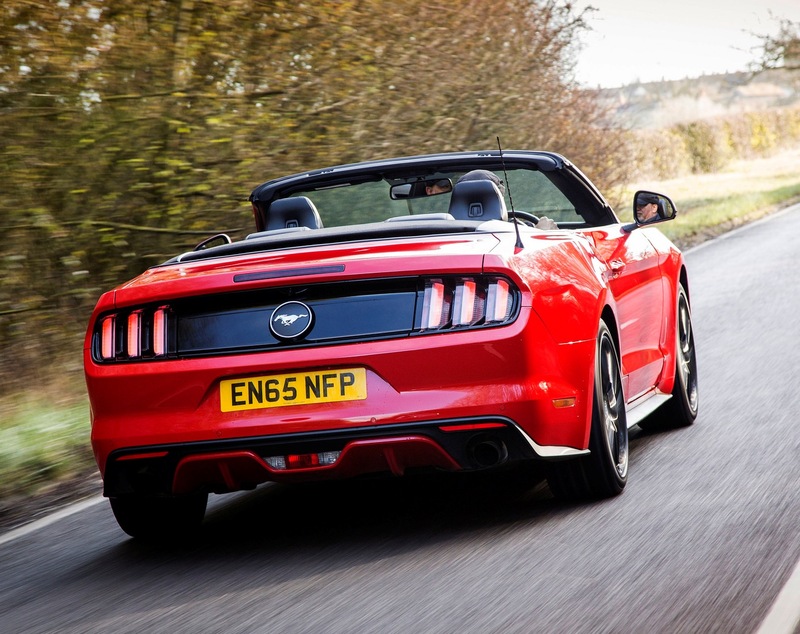 Ford Mustang – News and hot stuff Convertible Road Test – Could this be a cure for the summertime blues? FORD’S ICONIC RETRO SPORTS CAR STILL MUSCLING IN WITH RECORD SALES. A timely press release from Ford arrived in my In-Box recently claiming the new generation Mustang is the best selling sports car on the planet. A fact that was hard to digest when you consider the global sales of the Audi TT or the Mazda MX-5. Reading further it appears that the all-new Mustang pony car, built for 140 global markets, not just the USA where it had been the best-selling sports car for over 50 years, had indeed recorded 150,000 global sales in 2016, an increase of 6% over 2015. Of that total 45,000 had been sold outside the USA and of that total 15,335 were in Europe with the UK accounting for just 3,250 of European sales due to the delayed arrival of right hand drive models. 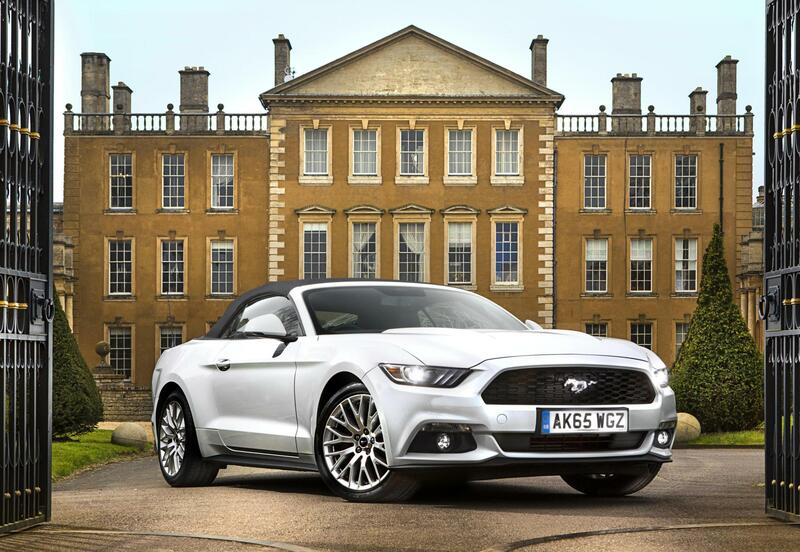 After the initial rush to obtain a new-generation Mustang demand is still very strong and in the UK Ford is now quoting a delivery time of 30 weeks between placing an order and the Mustang arriving. 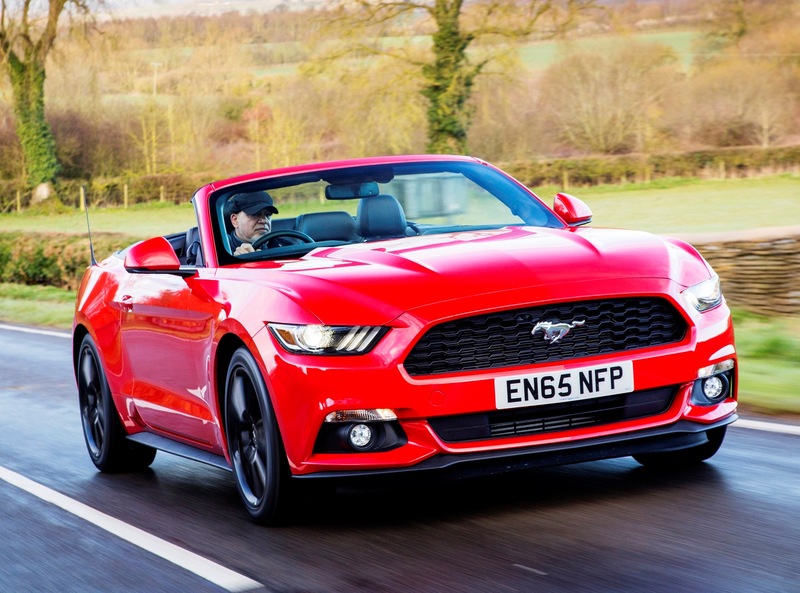 From its UK launch date at the end of 2015, 4,775 Mustangs are now on UK roads with three quarters of them being for the Fastback hard-top variants over the soft top Convertible. Both are two door four seater models. When it comes to the choice of engines, 3,221 UK owners have gone for the iconic GT version with the 5.0 litre V8 416 hp petrol engine as opposed to the 1,554 customers ordering the 2.3 litre EcoBoost 317 hp turbocharged petrol engine, and demand for a manual gearbox model is marginally ahead of the automatic transmission option. Demand from by buyers outside the USA is fuelled by enthusiasts of motoring, petrol-head customers who love V8 American engines and their dramatic soundtrack. 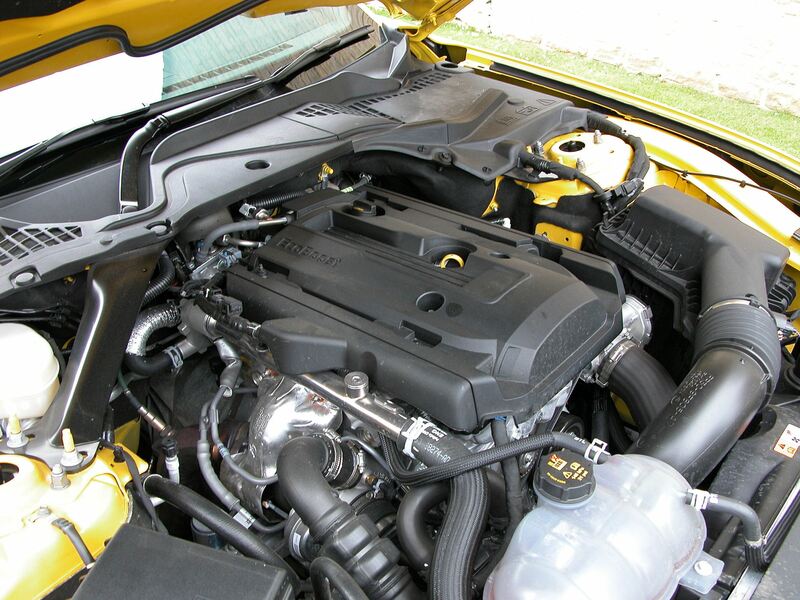 There is of course the desirability from the Mustang’s legendary muscle-car history, part of the appeal comes from the value for money pricing and also the option of a slightly less expensive and more fuel frugal 2.3 litre turbo petrol engine. Prices have increased since its launch and now start at £33,645 and rise to £38, 095 for the Fastback coupé and £37,145 to £41,595 for the Convertible, both with six speed manual transmissions. Both engines are available with a six speed automatic gearbox option which adds either £1,500 or £1,600 to those prices depending on the variant chosen. For the UK market Ford have just introduced a limited Shadow Edition 5.0 V8 GT slightly higher spec level for both body styles, manual and auto, with prices starting from £39,895 for the Fastback manual and topping out at £44,895 for the Convertible automatic. Unlike its predecessors from 1964 onwards, the new sixth generation Mustang is built in the US at Ford’s Flat Rock Plant Michigan, has been engineered from the start to include right-hand drive models. American muscle cars are not known for their handling finesse by European customers, great in a straight-line but not so hot during cornering and generally with a soft and sloppy suspension. But with the new Mustang Ford has grasped the bullet and decided that their models should be fit for global markets and the latest Mustang is the most technically advanced version ever. It features a new chassis of high strength steel pressings, ultra high strength aluminium castings and steel tube laser welded components, all bonded together to improve rigidity by 28%. But it is still over 200 kg (441 lb) heavier than some of its German competitors and it is bigger and wider than say an Audi TT or a BMW 2 or 4 Series Coupé /Convertible, its potential competitors in terms of price. In terms of size and muscle-power there are more expensive but better handling coupés and convertibles available from the three premium German brands. The new Mustang has independent MacPherson struts suspension at the front and an independent multi-link system at the rear instead of the archaic live axle and leaf springs system. Ford claim the handling has been developed to deliver European standards for high levels of balance, responsiveness and fun driving. Official European market models get Ford’s Performance Pack as standard which adds front strut braces, a thicker rear anti-roll bar and stiffer springs. Also the official Euro Mustangs get uprated 380 mm (14.96 in) front brakes with four or six pot callipers depending on the engine chosen, a larger radiator and additional oil cooler over their American market cousins. Similarly on-board user-friendly technology now includes for 2017 Ford’s latest voice-activated connectivity system SYNC 3 (that enables drivers to use voice control audio), navigation, climate control and connected mobile phones plus Emergency Assistance. Also complying with European requirements are Selectable Drive Modes to help the Mustang’s set-up match driver mood and purpose. On a twisty road, or a track day, a lift of the toggle switches quickly adjusts steering effort, engine response, transmission and electronic stability control settings to Normal, Sport+, Track or Snow/Wet settings. For V8 models there is also a ‘Line Lock’ launch control function which applies the front brakes allowing drivers to spin and warm up the rear tyres. The latest Mustang retains the long bonnet and short rear deck design with sleek front A and steeply raked windscreen and rear C pillars – again steeply raked with no B pillars in between. There is a low roofline linking the two with wide flanks to accommodate the significantly wider tracks. Retained is the iconic signature trapezoidal grille with the iconic galloping Mustang pony positioned centrally within it. Beneath that is what Ford calls the ‘shark-bite’ front under-bumper. These official European cars also have daytime running lights integrated in the foglight housings, and at the rear are ‘tri-bar’ LED taillights. How does the new Mustang size-up? Well its 4,784 mm (15.70 ft) in length and wide at 1,918 mm (6.29 ft) with a height of 1,394 mm (4.57 ft) and a wheelbase of 2,720 mm (8.92 ft). With the front seats positioned for adult comfort, rear seat legroom is minimal. Access to the rear needs to be a stooping affair because of the coupé roofline and watch out for those long two front doors, not good for UK side by side car parking. At the rear is a 332 litre (11.72 cu.ft) boot, not big but who buys a Mustang for carrying luggage? Inside it’s a mix of modern and retro. There is a high level front fascia panel which flows around to the high waistline and smallish windows. There is a hefty three spoke steering wheel with some control buttons and two large instrument dials and an information panel viewed through the wheel. A common feature with other Ford European models is the 8.0-inch colour touchscreen centrally positioned but low down in the fascia panel which accommodates the infotainment functions, Ford Sync 3 and rear view camera. It will house the optional sat-nav which strangely is not fitted as standard, but is available as an option together with an uprated 12 speaker sound system for £795. Beneath the screen are conventional ventilation, heater and air-con controls and beneath those are cheap looking chrome effect toggle switches, shades of old-school American car trim. The Convertible version has an electronically operated multi-layer fabric roof. The manual gear lever is a dimpled effect ball shaped knob – like a VW Golf GTi, and this provides a firm but short throw gearchange which isn’t the slickest to use. Overall the interior is a blend of modern and old fixtures fittings and quality. It lacks the refinement in electronic driver aids such as adaptive or adjustable suspension settings, blind spot monitoring and emergency radar braking found in premium brand European sports cars. But quite obviously it’s the Mustang’s heritage and the desire for being ‘retro’ that is appealing to die-hard UK customers. At the UK media launch in March 2016 I concentrated on driving the more popular Fastback coupé boy style with the signature and best selling engine – the 5.0 litre V8 petrol unit pumps out 416 hp and has variable valve timing with four valves per cylinder to meet EU6 emission levels. This slow revving unit provides 530 Nm (391 lb.ft) of torque at 4,250 rpm so for racier driving full use was needed from the six speed manual gearbox, which I found better than the slow-changing six speed auto unit. With huge CO2 emissions of 281 to 306 g/km VED road tax costs are very high for the new First Year rate at £2,000 but after that financial shock it reduces to the £140 Standard rate. However the car’s retro looks and glorious V8 exhaust soundtrack of the V8 version are priceless. This time around I had for a week long test driving programme the Convertible with the 2.3 litre, four cylinder EcoBoost turbo petrol unit with 317 hp and 432 Nm (319 lb.ft) of torque. Priced at £37,145 this manual gearbox version saves the UK buyer £4,450 with its lower purchase price than the Convertible V8 manual. Top speed is 145 mph, zero to 62mph 5.8 seconds, fuel economy for the manual gearbox is 34.4 mpg, (real life on test was 33.6 mpg), CO2 emissions are 184 g/km, VED First Year road tax is £800 reducing to £140 Standard rate thereafter. 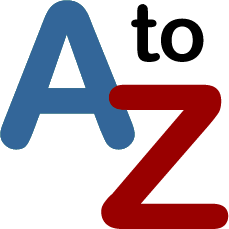 Benefit-in-Kind company car tax is 35% instead of the maximum 37% for the V8 models and insurance is Group 43E instead of 46E for the V8 Convertible model. For those not interested in outright performance, but want the styling of the Fastback or Convertible Mustang bodies, this might just be the best ‘cruising’ choice purely in terms of purchase and running costs. But it felt a bit weak in the engine department, it lacked the muscle of the petrol V8 and the exhaust soundtrack lacked the ‘theatre’ of what a Mustang should offer. The ride was generally compliant and comfortable, a bit soft at time on undulating roads but given its rigid construction and 19-inch alloy wheels it was good. Being a Convertible there was the occasionally ‘shimmy’ throughout the bodywork after impacts from potholes. It at least cornered well enough in an up-to-date manner but it’s not as agile or crisp in the handling department as its more expensive European premium brand competitors. For: First official right hand drive Mustang, excellent value for money, much lower running costs and purchase price than the V8 versions, high specification, retro name and styling, roomy front interior, comfortable ride, sound handling, high demand so far from ‘petrol-head’ UK customers. Against: Lack-lustre lazy engine unless driven in Sport+ mode, missing some of the safety driving aids of European rival models, feels clumsy on UK country roads, wide-opening long doors make it difficult to park in side-by-side parking spaces, the 2.3 litre petrol engine even in Sport+ mode lacks the soundtrack ‘theatre’ of the V8 and so it’s more a cruiser than performance bruiser – but it is cheaper to buy and run. 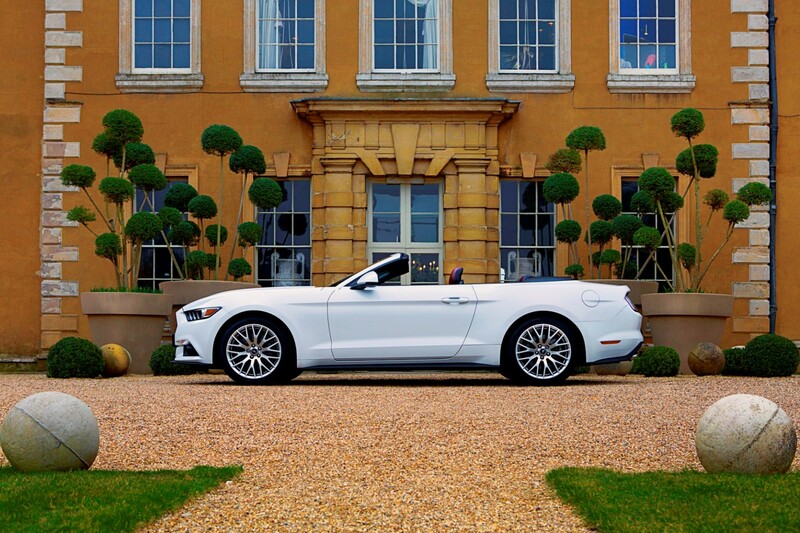 Ford Mustang Convertible 2.3 EcoBoost manual. 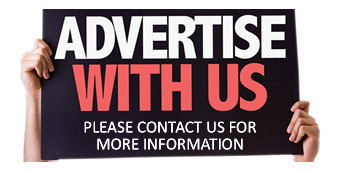 Price: £37,145 (as tested £39,525). Engine/transmission: 2.3 litre, four cylinder, turbocharged petrol 317 hp, 432 Nm (319 lb.ft) of torque at 3,000 rpm, six speed manual, multi-mode performance settings, rear wheel drive. Performance: 145 mph, 0–62mph 5.8 seconds. Fuel consumption: Combined Cycle 34.4 mpg (33.6 mpg on test). Emissions and taxation: CO2, 184 g/km, VED road tax £800/£140, BIK company car tax 35%. Dimensions/capacities: L 4,784 mm (15.70 ft), W 1,916 mm (6.29 ft), H 1,394 mm (4.57 ft), two doors/four seats, 332 litres (11.72 cu.ft) boot capacity.